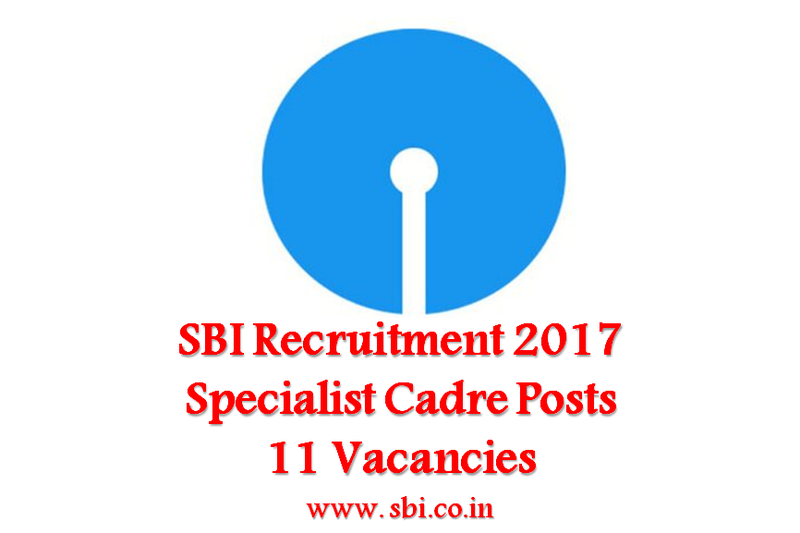 SBI invited applications for recruitment to 11 Specialist Cadre posts. The candidates eligible for the post can apply in prescribed format on or before 13 January 2017. State Bank of India -SBI Job Notification: SBI invited applications for recruitment to 11 Specialist Cadre posts. The candidates eligible for the post can apply in prescribed format on or before 13 January 2017. CAs/ MBA (Finance). Candidate with FRM/ PRM are preferred. Proficiency in Oracle/ SPSS is essential. Minimum 7 years of post-qualification experience in Risk Management. CAs/ MBA (Finance). Candidate with FRM/ PRM are preferred. Proficiency in Oracle/ SPSS is essential. Minimum 5 years of post-qualification experience in Risk Management. M.Sc.(Statistics). Candidates must have proficiency in Oracle/ SPSS. Minimum 7 years of post-qualification experience in Risk Management. MBA/PGDBM with specialization in Finance from a reputed Institute. Minimum 7 Years Post qualification experience in Analysis/ research role in Bank/ Financial Institution in Indian Foreign Exchange and Interest Rate market. MBA/PGDBM with specialization in Finance from a reputed Institute. Minimum 5 Years Post qualification experience in Analysis/ research role in Interest Rate market. Interested and eligible candidates are required to send their application online along with fee of Rs 600 (Rs 100 for SC/ST/PWD candidates). Copies of the application (registered online) along with photocopies of (i) ID proof (ii) Proof of Date of Birth (iii) Educational Certificates: Mark-Sheets/ Degree Certificate (iv) Experience certificates (v) Brief Resume (vi) e-Receipt for fee payment, (vii) SC/ST certificate, OBC (With Non creamy layer clause) certificate, PWD certificate as applicable should be sent to “ State Bank of India, Central Recruitment & Promotion Department, Corporate Centre, 3rd Floor, Atlanta Building, Nariman Point, Mumbai - 400 021” by post.